Headquartered in Seattle, WA, Acumatica is a leading provider of cloud business management software that empowers small and mid-size businesses to unlock their potential and drive growth. Acumatica technology was engineered by ERP veterans who have worked in the industry for more than 30 years, and who have expertise in accounting, distribution, project management, CRM, and more. Built on the world’s best cloud and mobile technology and a unique customer-centric licensing model, Acumatica delivers a suite of fully integrated business management applications such as Financials, Distribution, CRM and Project Accounting, powered by a robust and flexible platform. Your business isn’t confined to four walls. Why should the people who impact your business be? Acumatica goes wherever your people go — anytime, anywhere, and on any device. AME Corporation, a mid-sized manufacturer with operations in the US and China, sees 400% productivity gains with Acumatica. Screens open three times faster, navigation time between records is halved, and integration is seamless with online content sharing platform Box. P’kolino, a design firm in the US, switched its ERP system from Quickbooks to Acumatica. As a result, the company doubled productivity, saw a 75% reduction in data errors, and saved $80,000 a year, mainly through the automation of sales orders. Interested in hearing more Acumatica Customer Success Stories? Click here to read more of their case studies! Algorithm is a Certified Gold Partner with Acumatica—this means our staff has reached the highest level of expertise and training in order to ensure we deliver the best implementation experience to our clients. This coupled with our 200+ years of combined ERP experience, an unparllaled understanding of business process requirements, and an insatiable desire to be the best gives our customers the confidence and results they deserve when implementing Acumatica. Experience Acumatica at a glance and read testimonials from companies like you who have found success with Acumatica. 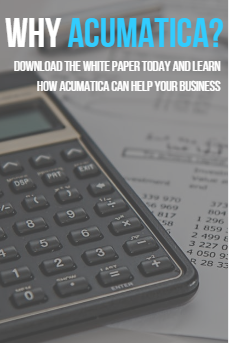 How can Acumatica help your organization drive growth, manage costs, and be productive? Get the specifics in this data sheet.